Stock up on this limited-edition bottle. Photo courtesy Moet et Chandon. Going to a Golden Globes party this weekend? Bring a bottle of the official Champagne! 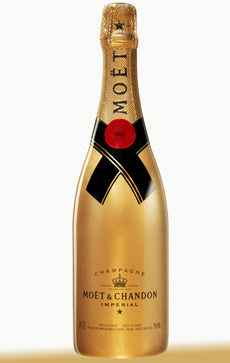 Moët & Chandon returns as the official Champagne of both the 2011 Golden Globes and the Academy Award. Its limited-edition Gold Award Season Moët & Chandon Impérial bottle is a beaut. The limited-edition bottle retails for $39 and is available through March 31st wherever Moët & Chandon is sold. The Champagne will continue to age well for the next 10 years, so you may want to stock up. It’s an impressive gift to give year-round. Bone up on the different types of Champagne. Make our favorite Champagne cocktail, with St. Germain Elderflower liqueur. It’s amazing! The correct way to pour Champagne.